The Marlborough bedroom range is a high quality collection of pieces crafted from solid American oak finished with a beautiful waxed finish. The 4+2 drawer chest has a classic look, fitting perfectly into a variety of bedrooms. This Marlborough 4+2 drawer chest provides your bedroom with practical storage space and added surface space. The four wide drawers provide you with plenty of storage space for all of your folded clothes. Whilst the two top smaller drawers are ideal for smaller, delicate items. The large surface top are is ideal for displaying ornaments, photographs or even a lamp. 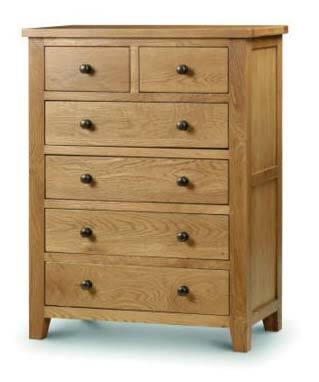 The Marlborough chest has been constructed from solid American oak which gives it an instant high quality look. Finished with a smooth waxed finish, emphasising the beautiful natural wood grain. This chest of drawers has a classic style with a versatile finish making it the perfect piece to coordinate perfectly in many different bedroom settings. This chest is constructed from solid American oak and finished with a warm waxed coating to protect the surface and accentuate the natural wood grain. The drawer bases and back panel are thick plywood. Complete with contemporary round metal handles. Looking after your new item is very simple. To maintain a clean, dust free finish simple wipe down with a dry duster and for tougher marks a damp cloth is ideal. Julian Bowen advise against the use of harsh chemicals and cleaners. It couldnt be easier. This chest of drawers is delivered assembled, taking away all the stress. All you need to do is fill up the drawers. Answer from LucyConway Hello, The small drawer dimensions are H 13cm x W 29cm x L 31cm. The larger drawer dimensions are H 13cm x W 64cm x L31cm. Thank You, Lucy. Answer from LucyConway Hello Liz, There are no metal drawer runners on this chest, they are wooden. Thank You, Lucy.